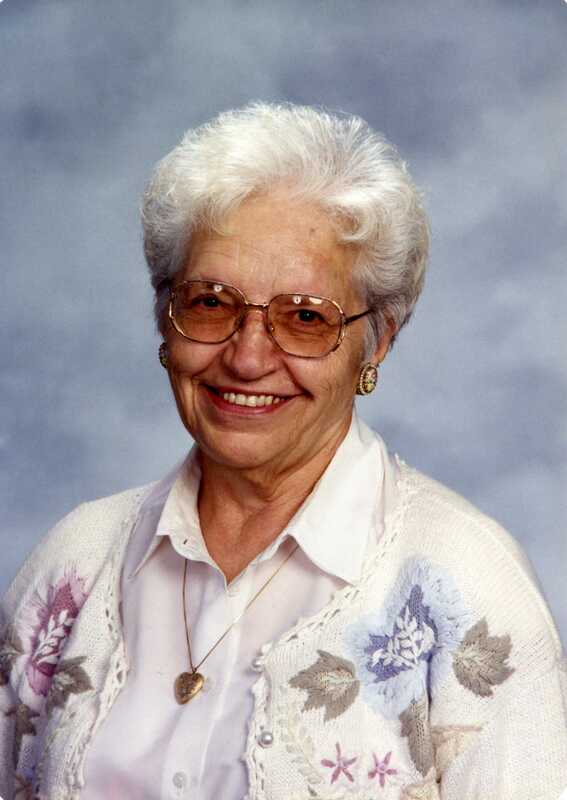 Lila Harvatin Anderton, 93, passed away Sunday, May 17, 2015 in Mesa, Arizona. She was born in Park City, Utah to Jacob and Olga (Milosevic) Harvatin on March 7, 1922. She anxiously awaited this step so she could once again be with her beloved husband, Gerald Fullmer Anderton, parents, brothers and sisters, a grandchild and great grandchild who preceded her in death. She was especially excited about the prospect of reuniting with her parents as she was orphaned at a young age and never knew them. As a young child she was taken from the orphanage in Salt Lake City and raised by loving foster parents, Ebenezer and Lilly Mae (Ralph) Richins. It was in the Richins’ home where she was introduced to the gospel and became a member of the Church of Jesus Christ of Latter-day Saints. Her testimony of the Savior was a strength and support to her throughout her life. At age 15 she accompanied her foster sister Mary Wells who needed moral support for her audition with the Mormon Tabernacle Choir. At the try outs Lila was invited to audition and upon hearing her sing was immediately offered a spot as a member of the acclaimed choir, a position she held for 11 years. Just before Lila graduated from high school she was in a terrible bike accident that changed the course of her life. Her dream of going to college was shattered as well as the perceived disfigurement of her face. On September 23, 1946 she married Gerald Fullmer Anderton in Salt Lake City where their first 5 children were born. A job transfer took the family to Boise, Idaho where the last 4 children were born and the family was raised. Before leaving Salt Lake City the family was sealed in the Salt Lake Temple on September 23, 1954. Lila had an amazing ability for creative writing and her sense of humor could be seen in all her writing. She started out at a young age honing her writing abilities in her school newspapers. She went on to become the editor of the Eimac News, a newspaper for which she was the driving force at Eitel-McCullough RadioTube plant in Salt Lake City where she worked helping with the War effort. Lila loved people and people were drawn to her warm, caring and witty personality. You could feel her love in the warmth and strength of her hugs and charisma. She was uninhibited, loved performing and could make people laugh. After all of her children were in school Lila was employed by the local newspaper, The Idaho Statesman, where her people skills and work ethics were well used for many years. After retiring she and Gerald enjoyed traveling. And, with 9 children spread out across the country, it was a great reason to go traveling. Several visits to children in Arizona convinced them that the weather there was much warmer and kinder to aging bones – especially during the winter months. As a result they became snowbirds and enjoyed the winter months in Arizona. A few years after celebrating their 50th wedding anniversary Lila’s beloved Gerald passed away after a battle with cancer. Lila then moved from their home of 45 years in Boise, Idaho to Mesa Arizona, which she grew to love and call home. A few years later Lila had the opportunity to take a trip to Croatia, the homeland of her parents. It was a phenomenal experience for her to connect with family and be introduced to cousins she never knew. At last she felt she belonged to a family. It was one of the highlights of her life. During her later years Lila loved working with family history, specifically serving in the temple as a patron. Her last calling in the Church was to be a temple patron and to take others with her to the temple, a calling she faithfully fulfilled and loved! Throughout her life she served in many other callings spending many years as a Primary chorister and teacher working with children. Children loved her! She also enjoyed serving as a Relief Society President. Lila always had a great zest and love for life! Even as she got older she was willing to go with her children on road trips. She loved camping and was still enjoying tent camping, even sleeping on the ground, well into her 80’s. Her sense of humor, stubbornness, and sheer grit, her “never-say-die” attitude, made it an enjoyable experience for all. As she aged, her spunky attitude kept her going and she refused to be dictated to by an aging, slowing body, even to the point of frustrating her doctors, let alone her children. But now she is at rest and enjoying eternal family relationships. Left behind to carry on her legacy of love is her numerous posterity: 6 daughters, Rosemary Morley Austin – Chino Valley, AZ, Geralyn (Frank) Brown – San Diego, CA, JaNene Anderton – Lewiston, ID, Shelley (Brett) Wierschke – Sturgis, MI, Laurie Anderton – Mesa, AZ, Darcel (Stanley) Turner – Eagle, ID; 3 sons, Gerald Douglas (Kathy) Anderton – Franklin, TN, Edward Kyle (Lori) Anderton – Everett, WA, and Richard Scott Anderton (Dave Emeson) – Phoenix, AZ; 25 grandchildren, and 32 great grandchildren and counting. Lila – mom, grandma, great-grandma, aunt, and friend – will be missed and loved by all. May God be with us and comfort us ‘til we meet again. Funeral services are Saturday, May 23, 2015 at 11 AM, preceded by a viewing at 9:30 AM, at the LDS Three Fountains Ward Chapel, 1852 N. Stapley, Mesa, AZ. Arrangements by Bunker’s Garden Chapel. I was so sorry to hear about the passing of your mother. She was such a special woman and loved by so many. As a teenager, I remember her teaching us how to make butter at her home on State Street. She even let us decorate our finished projects with M&Ms. She didn’t have favorites and loved us all. A few summers ago, I was privileged to have lunch with Lila and the old 9th Ward Lunch Bunch. What a blast it was reminiscing about the “Good Old Days” with her. My mother and I drove Lila back to her daughter’s home in Eagle afterwards. Honestly, we laughed and told stories all the way there, ending with many hugs and “I love Yous”. How blessed we all were to know Lila and be loved by her. How blessed we were to have our mothers as long as we did. To Mr. Anderton’s family, I’m very sorry for your loss. I wanted to offer you some comfort that I’ve found in the Bible. In John 11:25 Jesus said “I am the resurrection and the life. The one who exercises faith in me, even though he dies, will come to life.” It’s my hope that you can draw comfort and strength from this promise that we can see our dead loved ones again. Please accept my deepest condolences.